Many people start their day with a big cup of coffee. This delicious dark elixir offers a shower of benefits, not least of which is fueling your morning commute with caffeine. Coffee has become a fundamental part of our lives. If you love your coffee shop coffees but don’t like the price tag, you might consider buying a coffee maker to use at home. Not only will this save you money, it is also more convenient to grab your coffee on the way out the door without having to make a pit stop on the way to the office. In today’s best Keurig coffee maker reviews, you’re in for a treat if you find the whole coffee machine buying process rather overwhelming. You can choose from many different types of coffee makers, the most common being the traditional drip coffee maker. This type of coffee brewer will yield anywhere from a few cups to a dozen cups of coffee, depending on its size. Increasing in popularity is the single serve coffee maker. The number one reason single serve coffee makers are so great is that you get a fresh cup of coffee each and every time. Coffee in a pot tends to start tasting burnt or stale after an hour or so leaving you to deal with the awful taste or dump the coffee. What a waste. A few more benefits to choosing a single serve coffee maker are that they are super-swift since you don’t have to wait for a full pot to brew, they are convenient to use, you get quality coffee without fail and each person using the machine can customize their coffee to their liking. There are many different single serve coffee makers to choose from, but the firm favorite comes from the industry titan Keurig. The Keurig company has been around since 1998, and they are the original maker of the single serve coffee maker as well as the single serve coffee pods that their machines use. Keurig offers over 400 varieties of beverages to choose from including over 60 brands of coffee. No matter what you drink, Keurig’s got it! Sit back as you’re in for a treat! III. What Is the Best Keurig Model? This 1.0 Keurig is a replacement for the mighty K45 and the K55 is a very worthy successor. 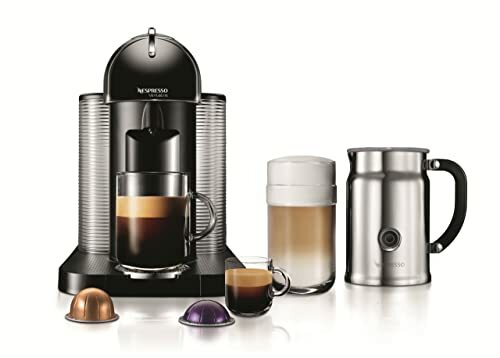 Choose from 4 colors and make up to 6 cups of coffee with this awesome single serve machine that takes any K-Cup pods. If you want the convenience of a single serve Keurig with a little more versatility and scope for customization, the K-Elite is part of the newest generation that delivers in fine style. Choose from a range of brew sizes and enjoy the best iced coffee as an added bonus. This full programmable range-topping Keurig is one of the revamped 2.0 models. Finished in sleek platinum, you can make a range of drink sized and also accommodate a carafe if you want even more coffee! 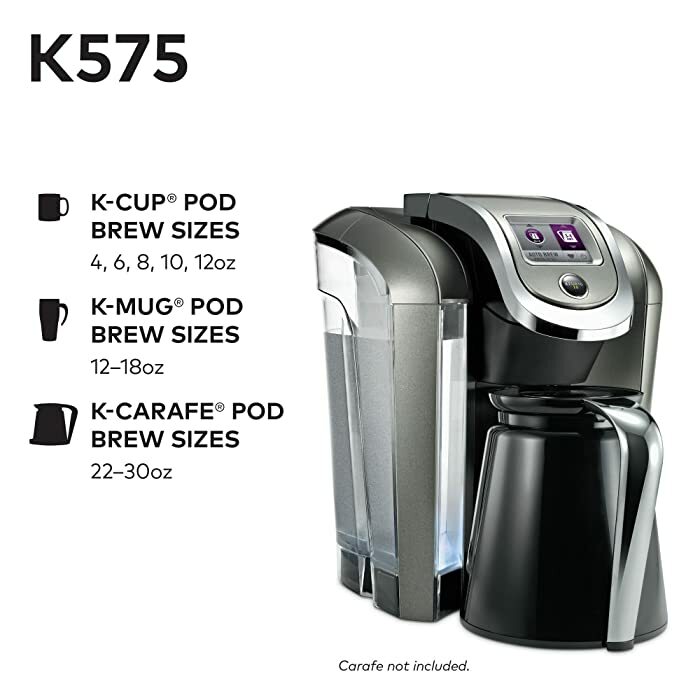 The K475 packs a 70oz water reservoir and, although it’s limited to proprietary Keurig pods, this scaled-down machine offers top-notch coffee in less than a minute with fully programmable functionality. For an affordable commercial coffee maker, look no further than the Keurig K145. With auto shut-off, shotgun delivery and a build quality to ensure it stays the distance, you can’t go wrong with the K145. The K250 is a simple and compact single serve coffee maker coming in at an extremely attractive price. The base model of the 2 series, this excellent little coffee maker is the wave of the future. From the original line of 1.0 Keurig single serve coffee makers, the K-Mini K15 only has a single cup water tank. If you live alone or have limited coffee needs, this mini machine is a smart buy. Whether you want a short or long espresso, a cappuccino or latte, the Rivo ensures you can enjoy your specialty coffees without any fanfare. Although it’s tasky to clean, the results are well worthwhile. For a solid and dependable commercial coffee maker with an extremely generous 90oz water reservoir, the Keurig K155 is tough to beat. Invest in one of these for your office and it will be money very well spent. Replacing the now discontinued K45, the Keurig K55 is a 1.0 model that regularly tops the list of the best Keurig single serve coffee makers. Although it might at first glance appear to lack some of the bells and whistles of more upscale coffee makers, this very simplicity without sacrificing core functionality is one of its main selling points. Available in black, blue, red and white, you can choose something to mesh nicely with your kitchen décor. You’ll be able to enjoy an assortment of K-Cup pod sizes (6, 8 and 10oz) so you can tweak the strength according to your palate. If you make use of the 6oz option, you’ll get the strongest coffee. The generous 48oz removable water reservoir is good for 5 or 6 cups before it needs topping up. With the K40 and K45 now consigned to the history books, investing in a Keurig K55 might be one of the wisest decisions you make this year. For top-notch coffee in 60 seconds flat, road test the K55 today! Making coffee with the K55 couldn’t be easier. Top the water reservoir up and grab your K-Cup pod. Hit the power button and hold fire until it starts blinking. Lift the lid and pop your pod inside. Choose from the 3 sizes (6, 8 and 10oz for a small, medium or large cup) depending on how strong you want your coffee. In no more than 60 seconds, your piping hot coffee is served. Keurig continue to expand their impressive range of single serve coffee makers and the K-Elite is an eagerly awaited model bringing iced coffee not just hot drinks in a sleek and compact unit. The fully programmable K-Elite comes in a mean brushed metal so it has looks to match its performance. This model has been introduced to put a bit more flexibility into the idea of a single serve coffee. Whether you want a dinky 4oz short drink or a more generous 12oz Americano, the ability to choose your drink size is a real bonus. When it comes to strength, punch the Strong button if you prefer a bit more oomph. The water reservoir is class-leading enabling you to enjoy up to 8 steaming coffees before you need to top up the tank. Speed has always been one of the key selling points with single serve units and you’ll get coffee in your cup within a minute which is as good as it gets. You can use a broad spread of K-Cup pods with none of the restrictions you’ll find on some Keurig second-generation machines. With those DRM limitations history, you can choose the coffee you like without being hemmed in. You’ll have over 500 different options so you’ll never get bored. Do you sometimes hanker after an iced coffee? If so, just brew over ice using the designated setting and you’ll be rewarded with a rich and full-bodied cold drink with none of the weakness that can spoil iced brews. There’s very little we can say to knock the K-Elite. The only thing to be aware of is the cost of pods on an ongoing basis. While they are cheap when compared to coffee chain drinks, if you drink a great deal of coffee you might find this machine becomes an expensive vice. For the perfect combination of convenience and quality with stunning looks thrown in for good measure, we’re confident the Keurig K-Elite will attract a loyal following in no time so check one out today and you won’t be disappointed. One of the rebooted 2.0 Keurig models, the K575 comes in at roughly twice the price of the K55 and is currently the flagship Keurig. You’ll enjoy an extremely generous water reservoir good for at least 10 cups of coffee and you can take advantage of making cups or carafes depending on your preference. The muted platinum colorway means it’ll look great in your kitchen and the scaled-down dimensions ensure it won’t clutter up your counter. With a fully programmable machine featuring a crisp display, you can enjoy technology without being overwhelmed by a complex system. The Keurig K575 is one of the best Keurig coffee makers on the market and you should pop one on your shortlist. As with all Keurig single serve coffee makers, simplicity is uppermost. There is no messing around like you get with a full-bore manual espresso machine and this is one of the principal reasons for the continuing popularity of single serve machines. Fill up your reservoir making sure it falls between the minimum and maximum levels. Note, too, that you need to run the machine a couple of times before using it to clean it through. Snap the water filter into its place in the bottom of the reservoir. The machine will now fill and pre-heat. Put your cup or the carafe in position. Slip in your K-Cup pod and choose your size before hitting the flashing button. If you’re looking for one of the higher end Keurig 2.0 models but you are also budget conscious, the K475 makes perfect sense. The 2.0 range from Keurig offers you the best of their pioneering technology but you will be limited to using their proprietary pods. With the K475, you can plump for a color to match your kitchen and choose between making cups or carafes. The 70oz water reservoir capable of yielding up to 8 cups of coffee means it’s an entirely hassle-free experience to bring Starbucks quality coffee into your home at a fraction the cost. With a reduced footprint making it great for anyone in a small apartment and the total flexibility you expect from all Keurig single serve coffee machines, the K475 is well worth your further investigation. Many of the Keurig single serve machines are very similar in terms of overall functionality and the K475 operates in much the same way as its bigger brother. You need to fill up the reservoir and ensure the filter is in place for a clean, sediment-free drink. Choose from a cup or carafe then tweak your temperature and strength settings so you’ve got the perfect cup for you and your family. Fit the pod into place, press the button and hey presto, there’s your caffeine fix in the time it takes to wash your hands. Although it looks pretty similar to the Keurig main line, the K145 Office PRO is a hard-hitting little coffee maker ideal for commercial use. The relatively small dimensions of the K145 mean it will fit in easily to a smaller premises while the rock-solid build quality ensures that it will stay the distance and not give up the ghost after a month of relentless use. Although it might seem a little limited in terms of what it will do, you’ll get ample choice with 3 cup sizes to choose from and the ability to accommodate travel mugs if you take out the drip tray. The removable nature of this tray also leads to simple maintenance and cleaning, crucial in a business where time is money. For an affordable commercial coffee maker, the Keurig K145 Office PRO is very hard to beat. Switch the machine on and it will start warming itself automatically. You only need to do this once you start your working day and it will remain switched on unless it’s unused for 2 hours. Insert your K-Cup pod. Put your cup underneath and select the size using the simple dial. The light will go out once it’s heated at which point you shut the lid and hit the blue button. In less than a minute, you’ll be back at your desk drinking a delicious cup of coffee. Coming in an impressive 8 colorways, there’s truly something for everyone with this neat little single serve coffee maker. It’s a nice touch to get a simple black and white touch screen considering how inexpensive the K250 is. The display is clear and easy to read and all you need to do is select your brew size to enjoy the optimum golden cup of coffee. As with all 2.0 models, you’ll be restricted to the K-Cup pods so make sure you’re aware of this before purchasing. For a small but impressive single serve coffee maker at a pocket-friendly price, the K250 from Keurig is a smart choice. The first time you use your machine, you’ll want to allow the filter cartridge sit for a few minutes in some cold water. Fill the reservoir with cold water then insert the filter. Hit the central Keurig 2.0 button, open the lid and put the K-Cup pod into the chamber. Select your drink size using the touch screen, press the central button again and you’re good to go. Coffee making doesn’t get much easier! If you’re on the trail of an uber-compact single serve coffee maker without sacrificing the quality of your caffeine fix, the Keurig Mini K15 is worthy of further investigation. 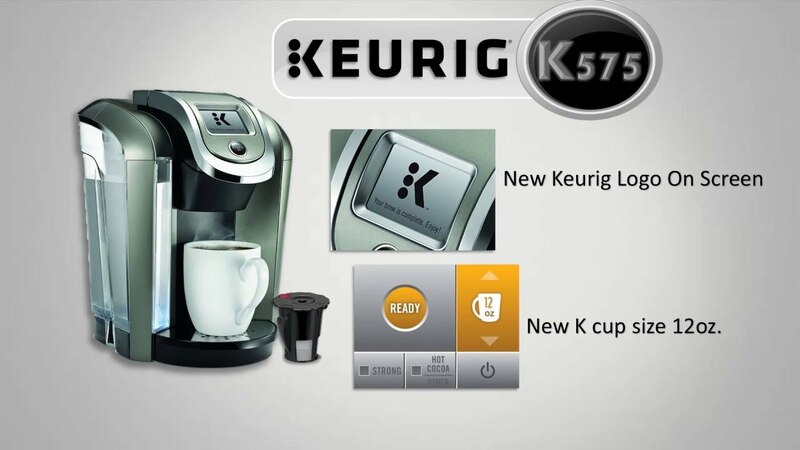 The K15 is one of the original line of Keurigs so you’ll be able to use a wider range of pods. Although it’s now a little long in the tooth, it still looks fresh and shows no signs of its age. While the single cup water tank will miss the mark if you have a busy household all clamoring for their morning coffee, for anyone with smaller families or living alone, this tiny little machine is ideal and punches above its weight. Operating the Keurig K15 is a breeze. Add enough water to the tank for your cup of coffee and insert the K-Cup pod. Simply press the brew button and choose your cup size then wait for perhaps 2 minutes and you’re all set. You add the same amount of water regardless of the size cup you choose. Single cup water reservoir will be restrictive for some so make certain you know this before plungging in. If you’re on the trail of a relatively inexpensive way to make coffee shop style cappuccino or latte at home, look no further than the Keurig Rivo. You’ll be able to opt for a short or long espresso and choose between 3 types of froth if you prefer a longer coffee instead. You should be aware that, although it’s very straightforward to use, you will need to clean this coffee maker a little more frequently than most Keurigs. Also, you won’t be able to use K-Cup pods or regular coffee. If, though, you are a fiend for espresso, latte and cappuccino, invest in the Rivo today and you will not be disappointed! 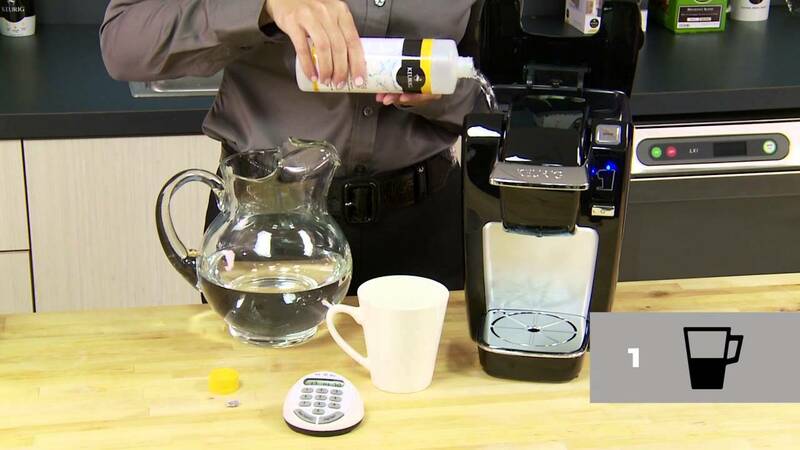 With Keurig’s majestically simple Rivo technology, you can make myriad different drinks using just 5 buttons. Espresso is incredibly simple. Make sure the reservoir is full, insert your pod and choose from a long or short espresso and you’ll be ready to roll in a minute or so. To make a cappuccino, place the pod in the brewer and a 12oz cup underneath on the drip tray. Make a short espresso by pressing the button on the bottom left. Pour in some cold milk to the frothing pitcher and replace the lid. Add no ice or syrup before frothing as this might damage your system. Hit the froth button. Remove the frothing pitcher, remove the lid and pour into your espresso for a delicious cappuccino! Be sure to clean the pitcher after each use. Every 10 or 12 drinks, clean all interior components. If you have an office and fancy a single cup coffee maker that looks great and performs just as handily, think seriously about the Keurig K155. The K155 offers you the choice of 4 different beverage sizes – sadly not a 12oz! – and allows you to program everything from an intuitive color touch screen. With an exceptionally generous 90oz water reservoir, you can even plumb this unit straight into a water source if that’s not quite enough for your needs. If you want a rugged and dependable coffee maker and you’re prepared to accept a little noise kicked out in return, the Keurig K155 is a strong contender for the best commercial single serve coffee maker currently on the market. Everything you need is easily accessible from the color touch screen. Top up the reservoir and choose your size of brew after ensuring your pod is in place. In a minute or so, you’ll have the perfect cup of coffee in your hand. With everything controlled from the screen, brewing coffee has never been this easy! Over the years, Keurig has improved upon their original design making changes and tweaks where needed. There have been nearly 60 models brought to market and with so many to choose from it can be hard to wade through the information and find out which one is best for your needs. Having hit you with a full selection of Keurig reviews, we’ll now take a closer look at a couple of our favorite Keurig single serve models. If you want to know more about what other available models have to offer, be sure to check out our Keurig coffee maker reviews above for an in-depth report on them. 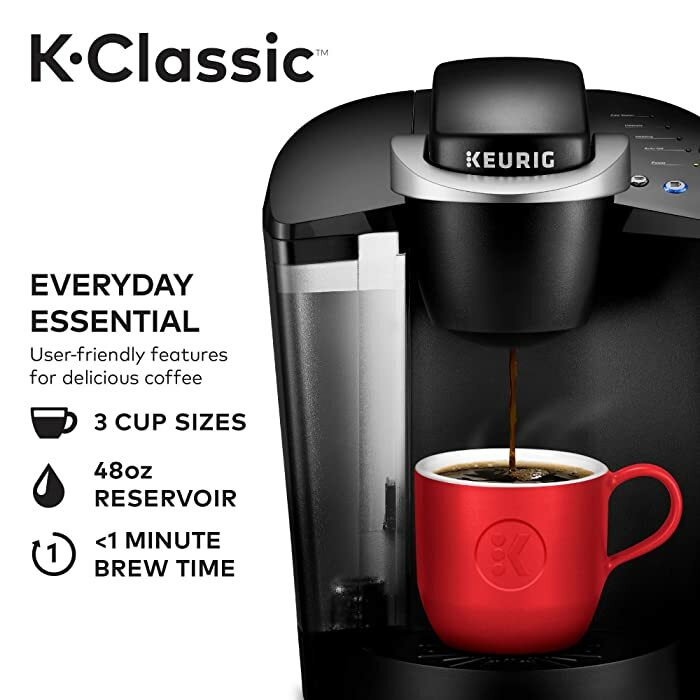 We’ll double down now on the Keurig K55 K-Classic and the Keurig K575. One of the main benefits to rolling with the K55 model over others is the price. When looking at single serve coffee brewers, it is easy to become overwhelmed by cost, but this K55 is a great option for the budget conscious. One of the reasons it is more affordable is that is doesn’t come with a lot of the extra features that the more expensive models do but don’t let that fool you! This is a wonderful single serve coffee maker. When opting for this model, you’ll be delighted with its ease of use, its affordability and its versatility. It’s a great choice for any home. This is Keurig’s strongest brewer, and it gives the user an incredible array of choices and features to use. It makes brewing coffee a truly enjoyable experience. The Keurig 575 has a legion of happy users and perhaps you will soon be one of them. Touch Screen – This machine features an extra-large color touch screen for ease of use. It contains a digital clock, a night-light with multiple color selections, and multiple programming options to suit your needs. Keurig is the original, and every single serve coffee maker since Keurig came out is just imitating them. Sure, some have made changes and there are differences, but Keurig is still the number one brand for a reason. They’re simply the best. The variety in available sizes as well as the incredible functionality are just two of the reasons people choose these machines. You can choose from a wide array of models that all have different features and specifications to meet your needs. Boasting impressive features, simple operation procedures, a plethora of drink choices and incredible functionality, it’s easy to see why Keurig remains a best seller decades after first hitting the market. Single serve coffee brewers get a lot of use. To make sure you get the most out of your machine, to ensure it lasts a long time as well as making sure your coffee tastes good every time, you will need to clean the machine periodically. This process of cleaning your Keurig coffee maker is called descaling. Depending on how hard your water is and how often you use the coffee maker, minerals will build up in the brewing system and can cause clogs to accumulate. If left alone, these clogs can result in the machine ceasing to work entirely. To avoid these problems, it is important that you clean your machine and that you do so properly. First, you must take care of a few simple tasks to ensure your machine is ready to be cleaned. If there is water in the reservoir, empty it. If your machine has a water filter, remove it. Follow your brewer’s instructions and shut off the “auto-off” function so your brewer will be able to run through the entire descaling process. You will need the Keurig Descaling Solution to complete this task. You can purchase the solution here. Now that you have descaled the brewer, you need to make sure you get all the cleanser out of the brewing system in case it ends up in your drink later. Now your reservoir is clean for the week! To keep the brewer functioning properly, you also need to clean the drip tray and the pod holder. These are tasks that should be carried out on a weekly basis. Cleaning the drip tray is easy. Simply remove the tray from the coffee maker and empty it. Wash it with warm water and soap, dry the tray with a clean cloth and place the tray back on the Keurig machine. To cleanse the pod holder, you need to remove it from the brewer. Be mindful of the sharp needles so that you don’t hurt yourself! Rinse the pod holder with warm water but do not use soap. Let the pod holder air dry and place it back in the brewer. When you place the holder back in the brewer, make sure you line the arrows up so that the piece is in the machine correctly. Additionally, you should wipe down the Keurig machine’s exterior frequently, at least once a week. This will keep it looking nice and prevent junk from getting into the machine and causing problems, or even worse, landing in your drink while it’s brewing. Keurig recommends using bottled water or spring water instead of tap water to reduce the amount of buildup in the brewing system. No matter what type of water you use though, you will still need to descale your coffee maker several times a year. Also, if your Keurig coffee maker uses a water filter, make sure you replace it on a regular basis as well. It doesn’t make a difference what type of water you are using, the filter will still need to be replaced. As with any small appliance, from time to time you might run into problems with your Keurig coffee maker. These snags can range from small issues like the machine brewing too slow to seemingly catastrophic issues like major water leakages. In this section, we’ll take a look at some of the most common problems faced by Keurig users as well as how to tackle these problems and get back to brewing. Keurig has excellent customer service and it is important to them that their customers are satisfied with their products. If your Keurig coffee maker is still under warranty, you should absolutely call customer care before attempting any fixes yourself. If you are having problems with your Keurig coffee brewer, contact Keurig’s customer care. You can do this by calling them at 1–866–901–BREW (2739). You can also reach them through their Contact Us page on their website. When contacting customer care about the issues you are having with your Keurig, make sure you have your serial number available. You can find this number on a sticker that is located behind the water reservoir on your brewer. After using your Keurig coffee maker for a while, you might notice that it isn’t brewing as well as it once was. Perhaps the machine is only brewing you a partial cup of coffee or maybe there is no water being dispensed at all. The exit needle of your Keurig coffee maker is important as this is what allows the brewed coffee to pour into your cup for you to enjoy. After repeated use, this needle can become clogged with coffee grounds. When the brewed coffee flows through the needle into your cup, it will contain more than just your delicious coffee resulting in a cup of coffee that has been soiled by the coffee grounds now floating in it. To remedy this problem, you need to clean the exit needle. This might seem like a silly problem, but sometimes your machine just needs more water to do its job correctly. Make sure the water reservoir is full and try to brew your cup again. Sometimes you might get a message on your display screen that says “Oops” and gives some information. This message does not mean that your machine is malfunctioning or broken, it just means that the K-Cup you are trying to use with your Keurig brewer is not compatible with it. Keurig 2.0 models have been developed to work with only Keurig specific coffee pods. The lids of these pods contain information that allows your coffee maker to know what it is brewing (coffee, tea or cocoa) and how much of it needs to be brewed (mug, cup, or carafe). If you try to use a coffee pod or K-Cup that was designed for earlier models, it will not work and your Keurig will give you the “Oops” message. You can alleviate this issue by using the proper K-Cups for your specific Keurig coffee maker. Again, if you try to fix these problems or any others and are still not succeeding in getting an acceptable cup of coffee or other beverage, please contact Keurig’s customer care at the above referenced phone number or contact page. Read More: How Can I Brew My Coffee Without Keurig Logo Pods? After reading this guide, you can easily see why Keurig coffee makers consistently top the market. They are well made and feature-rich and as long as you care for them well, they will stay the distance. It can be tough to choose when there are so many options so be sure to consider all the features and specifications to ensure that you get the Keurig that is best for you. Determine how many cups of coffee you want to make before refilling the reservoir, how many different cup sizes you want to be able to choose from and whether you be brewing more than just coffee. With these preferences in mind, you can make a selection that will best suit you. We hope that you have found a treasure trove of useful Keurig-related information in this bumper guide and that it will help you to make an informed decision when purchasing your Keurig coffee brewer.